Empty trains... do people really like working alone? Travelling upto London to work for three days this week, I have been struck by just how empty the trains have been (and the Underground for that matter). My train carriage contained only two people including me. A great work time with no disturbances and a good time in an office environment to catch up! Here, 'hotdesking' is the norm for me, which is a really efficient use of space. But most people (including me) really do work better with people around them to interact with - when they want to. It was almost lonely working in a sparsely populated office and train! Aaaah! Having said that, the few occasions when I do work from home I tend to work far longer hours and get far more done. It's about having a variety of working styles and environments I guess. But seriously, there are still so many classrooms where students are expected to work in silence all the time, even when it's not appropriate to and this potentially actively hinders collaborative learning - it's just not how people behave in real life. That's why it is so important that, as we build new learning environments, we really do provide a variety of learning spaces with the agility to change to be the most appropriate for that particular learning activity. Even more importantly, staff must be confident in using them - another major challenge! Happy New Year Everyone and have a fab 2009! The pink screwdriver from two angles - one showing the headlight! Yesterday I posted a comment on the real need for colour and attractiveness in new learning environments to really help engage and motivate students and staff. This does, of course, also refer to the equipment that everyone uses. However, we don't have to be silly about it.... or do we? I really am not suggesting that we colour code all such resources in schools from now on, but all her female friends do think it is very cool! And... if you 'google' pink screwdriver it turns out that there are pages of pink tools aimed at the female market - so why haven't we cottoned on to this? Very bizarrely, writing about pink objects seems to attract a huge internet following in its own right. A previous blog post of mine 'The Pink Train' about my youngest daughter's new toy has attracted literally hundreds of hits in it's own right. Perhaps this Pink Screwdriver blog post will as well. Lets make 2009 a year of colour and excitement in our education environments! Lets bring some colour to our lives! I was talking the other day to a number of educationalists about furniture for schools. 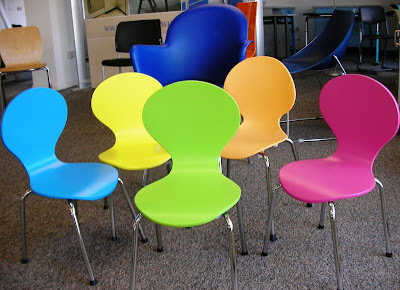 One said, quite determinedly that all chairs etc for secondary schools should be black, brown or dark gray - that's all. For heavens sake -why? Maybe bright pink is not the answer for everywhere, but lets bring some colour and excitement into our learning lives! The importance of colour and environments plays a huge role in how people work and perform in that space. If we give boring and dull, then it sets the mood. Carefully co-ordinated environments designed for a variety of purposes, with a variety of furniture and colours, can really help shape exciting vibrant learning spaces, that will, in turn, help creative and innovative learning. Lets really all try and make sure that 2009 is a year for helping create exciting and innovative learning spaces - for every one's sake! Oh and HAPPY NEW YEAR to every one! 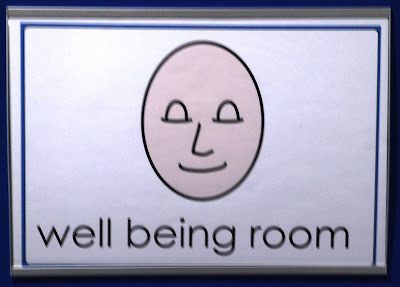 Spotted in a UK school recently was a 'well being' room for students (and staff - after school). It reminded me of when working in the Education Ministry of the Cayman Islands. We had our own small 'relaxation' or 'de-stress' room, complete with reclining chair, soft lighting, fabric round the walls for atmosphere, soft music and joss sticks to light (if you could bear the smell!). If you were having a bad day you could spend a period of time in there in peace and calm. We do need to value and look after our staff, they are always our greatest resource. Another school organised massages and well being events for its staff during developmental days - great! But these things can be just a little superficial (although popular). The whole approach to working with a staff team is about every aspect of the relationship. In these days of extremely rapid change, the team is essential - the relationships crucial. It is not just education that is changing, students are and inevitably, staff are as well - they have to. How we treat them has to be as outstanding and equal to (or better) than anywhere in the professional workforce. The need for true professionalism cannot be in doubt. How was the 'de-stress' room used in the Ministry - the excellent thought was there, but the problem was everyone was too busy to use it! Perhaps we all really do need to evaluate our work practices! 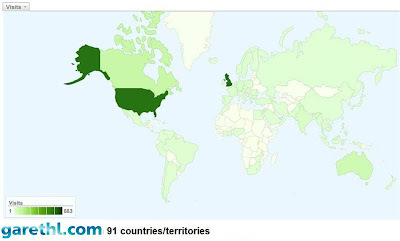 I am staggered to discover that readership of this blog has now reached 91 countries with many thousand readers. Additionally the readership figures have also increased by almost fifty percent in the last two months - amazing! My real thanks to all those people who have taken the time to visit the blog, no matter how briefly, and those hundreds of people who keep coming back. I will try and continue to make constant updates and keep it interesting, and not too serious, as I work and move all over the place. Transparency and collaborative learning - not here! As learning in the 21st century moves towards more collaborative, cross discipline teaching, with far greater transparency and openness, we are often reminded of the journey that staff and students have to undertake to feel comfortable and confident in new ways of working. Solid walls are being replaced to create far more agile spaces, with movable partitions, and, if there are walls, they are glazed with clear glass. It looks, feels and is different! No longer is what happens in classrooms a secret activity shared by just the occupants in the room at that particular time. Nor should it be. With increasing numbers of adults with different roles and skills working in schools, with older students mentoring younger ones, with stage not age learning, there has never been a better time for students and staff to be both excited and honest about the learning experiences taking place. Giving staff the confidence to work in new ways is a long and important journey. The planning and professional development opportunities to develop skills take lots of time. Not getting that bit right with the most nervous or determinedly 'anti' staff can undermine the whole process in schools! Get it right, and the learning opportunities and experiences can be just amazing! What do you do with a spare piece of land between the neighbours walls and an external hardcourt? So easily could it become a piece of nothing space, or the dreaded smokers corner! Most schools have such dead spaces, good ideas are always welcomed.. The answer for Islington Arts and Media School was to make it a fitness trail - what else? This photograph really does not do it justice as it cover three sides of the hard play space with two lanes,with lots of activities, one for each direction, thereby effectively creating a loop. With the mature trees in place it almost looks like a woodland trail. Students love it, it is very different, and they get more engaged in physical activities as a result. It is challenging whilst fun. It's just a really nice idea. I almost was tempted to try it.... almost but not quite....... Maybe after Christmas.... maybe! Retracing my steps to a former workplace in Islington after nearly eight years, I again came across the large and very long Millenium Mural down the entire wall of a building. I had forgotten all about it, it is huge! Nearly ten years on, it really has stood the test of time and become a real feature of that part of town. People will always talk about content and style, but it is still there after almost a decade - it really brightens the street up, and even better,there is little evidence of any damage. I frequently talk about including art into both learning and community environments, it just adds so much. When the stakeholders are engaged in the design and hopefully creation, the ownership and sense of belonging really kicks in! The same applies to schools. Celebrating art work by students throughout the schools (not just the foyer and art rooms) is a must. The attention it gets is remarkable and a real motivating factor for students, staff, paren and the local community. As we design new schools, the need for purpose built sculpture spaces is just a really vital aspect to be considered. In Islington this community would be a much duller place without the mural! Much like learning environments that do not celebrate the arts really! 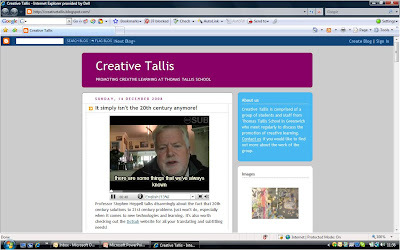 I recently came across a new blog Creative Tallis. This is posted by students and staff at the Thomas Tallis School in Greenwich, London, who are interested in creative learning. They apparently meet regularly to discuss what this means for the learning actuvuties that takes place in their school. Part of the post includes a video by my friend and 'guru' Professor Stephen Heppell who talks about the future of learning and technology, but including some history as well. As always it is a well reasoned 'chat' that makes so much sense. And, of course, he has been proved to be right so often! An interesting view (Blog post dated 14 December 08) click here! As for Creative Tallis - wouldn't it be just great if every school were so proactive about the learning that they want in their schools. Talking regularly about approaches to learning must have a positive impact in the school and is a great form of ongoing development. This must be especially true as they involve students, who are often so much wiser about their own preferred learning styles than the teachers! I will watch this blog with interest. I had the privilege of visiting The Avenue School in Reading today, a special school for 2 - 19 year students with autism and those with very complex special needs. The whole of this brand new building is just fabulous, being spacious, light and airy, from the welcoming reception through to the classrooms. Just one of the many great features is a three storey soft play area. Whilst that is truly amazing, even the other side of the wall has been made a real feature with windows, coloured panels, plants and soft furnishings. This school has a really great environment and enormous attention has been paid to the detail that makes it so appropriate for these students with a wide range of needs. I will post some more photos later. As always I suspect that some of this has been due to the total dedication, enthusiasm and energy of the Headteacher and her team who have been involved with every stage of the design process. There are, of course, a few lessons to learn - there always are with any new school, but there are many lessons that those designing new special schools should take from this just fab school. I really don't like corridors in schools but if we have to have them lets make them multipurpose and attractive. Too many corridors in schools are dark gloomy and totally dedicated to simply people moving them. 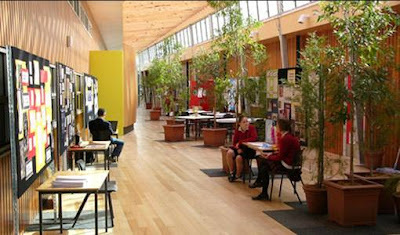 Some do get it right - Williamstown High School in Australia, (see photo above), has really managed to achieve light airy corridor areas that combines with learning, social and display spaces. It looks great! Schools are so often tied into corridors as single purpose spaces when they are thinking about new designs. This is really an issue that really needs thinking about carefully though. Many innovative schools are now abolishing corridors as a waste of space and incorporating circulation space with break out areas, feeding areas, social areas and learning zones. It is such a better use of space. 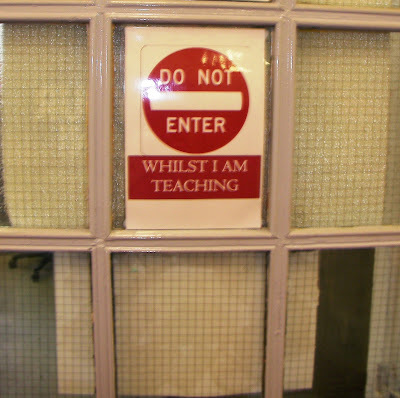 It is hard to encourage some teachers, locked into tradition, so see the benefits of this change of space. One only has to look at the change in public circulation spaces that is taking place all round us to get the message across. Railway stations used to be cold draughty spaces with one function - to get people on / off the train. Now, apart from very effectively moving people through the space, they have several social aspects, shopping, eating, relaxing, with meeting and social areas. Manchester Station is really quite a good example. Even better, the new station at St Pancras is quite an experience with trains almost tucked away out of space. 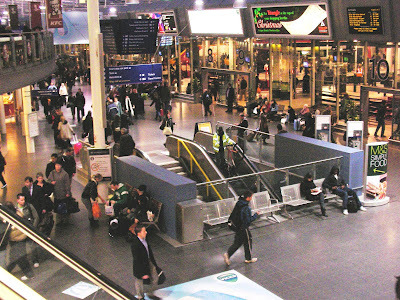 A colleague recently admitted they went there for the experience and the shops without wanting a train. How things have changed! This change mentality is what we need to do in schools regarding circulation spaces - these new environments are what our young people are used to - why shouldn't they be in schools? Stacking furniture.. encouraging agility in learning spaces. Whilst I am not convinced of the need for desks as such, I really liked the adaptable desks I saw today. With wheels on the back legs and a handle to move them by cut into the surface they were certainly easy to move around and did stack very neatly. (See photo below) They would certainly clear lots of space in learning environments and were light enough to encourage a range of configurations. People are coming up with a wide range of solutions to allow agility in learning environments - with so many ideas coming on the market, there must be things for most people. The biggest battle is to ensure people select and buy what will be most appropriate, attractive and comfortable for students - they're the ones who have to use it! In some cases students have selected from a limited range provided by a specialist supplier, and then their ideas were rejected. So why ask them? This really is a blog about education NOT football, it's just that I have visited two football grounds in two days. Tuesday was to the Derby County football ground for the Open Day of the Derby City BSF (Building Schools of the Future) programme. Derby City has high expectations of the BSF programme and are, this year, the most improved local education authority in the UK. They are ambitious and eager for every student to be able to achieve excellence in outstanding learning environments. Students from St. Benedicts School also performed extracts from a musical they had written themselves to the packed room of mainly dark suited men. They celebrating a wide range of talents and skills. Why shouldn't this type of performance be accredited as a form of project work? They had certainly worked extremely hard. with professional actors and developed a range of skills - you can't take a written test of this! However, whilst waiting in the foyer, I couldn't help but notice a slightly tatty disposable coffee cup in the display cabinet against the crystal and silver ware. Surely no one left it there by accident? Then I noticed it was signed. 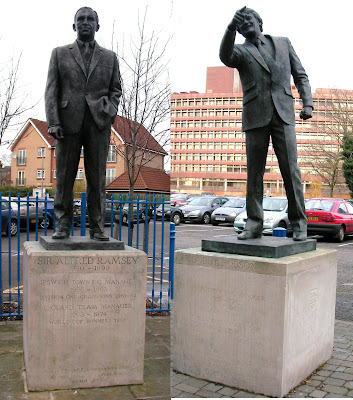 I wrote a post two days ago (see below) about the poor celebration of sporting heroes just below, with their statues being placed outside car parks - this is the opposite! Bemused I asked about the coffee cup -it turns out that in 2005, Derby player Paul Peschisolido kicked a ball towards goal during the match against local rivals Nottingham Forest. The ball was missing the goal until it hit this coffee cup which had been thrown onto the pitch and was deflected into the goal! It was allowed as no player had touched it. Although it looks rather out of place, no one can argue that they have not celebrated this strange story in style and continue to do so! You cannot always predict what success looks like or what causes it. How do we celebrate the many successes of our students if what they have done does not conform to the expectations we have or, as one Headteacher said to me, "within the celebration framework of the school" -what ever that is! A lesson here in all sorts of ways! celebration, display, expectations, and so much more! I visited the impressive 'managed IT services' at Suffolk Council in Ipswich today, operated by BT, to see the extent of the integration of services and the technical backup for the county wide service. This relieves the multiple end users having to worry about this aspect of their systems or spending money deploying their limited resources. It also, of course, allows integration across all the various services. Having the centralised technical staff phoning you informing you have a fault in your system before you have noticed it your self must be encouraging for Headteachers, and the many other users of the system! I just wonder why they did not notice themselves? L0ts of green icons on the screens is good - red is bad. If only everything in education could be monitored so easily. The photograph shows the desk of one of the system monitoring personnel... I get confused with two screens - if I had four to monitor ... eek! !